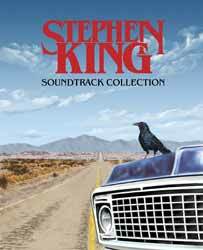 Varèse Sarabande releases the Stephen King Soundtrack Collection, a box set of four film scores across eight CDs. The projects covered are Dreamcatcher (2 x CD), The Stand (2 x CD), the mini-series version of The Shining (3 x CD), and Firestarter (1 x CD). The set is limited to 1500 copies, and incorporates a 24-page bound booklet. Let’s begin with Firestarter. In the 1984 movie directed by Mark L. Lester and featuring a young Drew Barrymore after the days of E.T. The Extraterrestrial, a college couple acquire telekinetic abilities and have a daughter born with the power of pyrokinesis. They are forced to go on the run from government personnel determined to use her as a weapon. This music is being reissued for the first time in 15 years. The score is by Tangerine Dream, who are no strangers to film music. In fact, their output over the years has been more than prolific – and revitalised by the recent release of Sorcerer on Blu-ray. Christopher Franke of Tangerine Dream composed and played all the music for the outstanding SF series Babylon 5. A ground-breaking achievement. Firestarter is considered to be some of their best work, but for me it’s too symptomatic of the 1980s with lots of high-pitched synthesizers battling with each other. There were so many movies from this period with a similar flavour it was difficult to see where it all came from. Many film scores are over-dramatic and this one comes across as Kraftwerk on speed! More than a little chaotic. In 1994’s The Stand, directed by Mick Garris, a catastrophic influenza virus wipes out half the population. The scattered survivors join with either Mother Abagail or Randall Flagg, and will clash in the ultimate battle between good and evil. This music by EMMY nominated composer W.G. Snuffy Walden is for the four-part mini-series adapted from King’s best selling book. Walden has composed music for a number of films and TV shows including The West Wing, The Wonder Years, Roseanne, and Leaving Normal. This is by far the best of the bunch on offer here. For anyone who likes rock and blues it will stand out as atmospheric and entertaining. Certainly, it is mostly music in its own right as opposed to incidental background vignettes. It begins with a chorus-effect steel guitar piece, and is followed by a slow guitar-picking melody. The remainder of disc one incorporates an electric guitar, keyboard effects and a drum machine; a slow piano piece, atmospheric mid-paced guitar in the style of Dave Gilmour, harmonica and violin. The final track of this disc is a gentle introduction to disc 2, which is more in the traditional vein of an incidental film with orchestral overtones. Immediately, the mood is darker and off-kilter. The guitar returns but is used sparingly – sometimes to create menace. There is some disturbing off-key piano, and a driven band concept which reminded me of John Carpenter’s Big Trouble in Little China (and in particular, Pork Chop Express). There is also a montage piece which brought back The A-Team building a Sherman tank out of old paint pots and a bag of nails! The Stand soundtrack is varied and very enjoyable. In 2003’s Dreamcatcher, directed by Lawrence Kasdan, a group of friends on a camping trip come into contact with a nearby town being assaulted by parasitic extraterrestrial creatures. Through the outsiders they will be attacked from within. This is one of those King adaptations I keep changing my mind about. But as for the music, it comes from Academy Award nominee James Newton Howard. There is a running theme of a ticking/clicking pace inherent in the music of these two discs. The first three tracks are upbeat and entertaining, but the standard isn’t maintained as much as I would have liked. There is a piano section as if to a child, an industrial piece which builds towards a crescendo but just stops instead, and low haunting rumbles and creaks like you would expect to hear in a 1950s science fiction show. Dramatic shrieks and orchestral flourishes turn to traditional horror score shock effects, before becoming a drama-like throb of televisual sound to wrap-up disc one. A similar throbbing music introduces disc two. Here there are Psycho slashes, wide film score moments, and paced action pieces. It then turns to the territory of the early tracks of disc one. It ends with a funky bass which fugues into the main theme. In 1997’s The Shining TV Series, directed by Mick Garris, a recovering alcoholic writer moves his family into a house as caretaker, only to discover to everyone’s cost that it’s haunted. This is a three-disc score penned by Nicholas Pike. Each disc follows the events of an episode, so that we get an approximation of the emotions endured by the characters over a three day period. Ambient noises, Halloween-like piano and wibbly you-are-now-entering-another-dimension sounds begin disc one. The first proper music comes with track seven’s 'Red Between the Lines'. The real menace begins two tracks later, and Halloween makes a return with some angelic singing. The order of the day here seems to be moderately-paced ambient sounds punctuated by the odd rumble and industrial slashes for shock value. It’s the same formula for disc two but with much more underlying menace. Also, the traditional horror music element of the cello to build suspense creeps in. Ditto for disc three. I expected some greater crescendos and longer suites for the conclusion of the piece, but no such luck. There are some alternative mixes at the end which, frankly, sound the same as the original versions. These three discs are the least entertaining as isolated music, which is odd as the TV version of The Shining is considerably better than the film and I’m certain I would have noticed if the soundtrack felt out of place. They do say the best incidental music is that which you don’t notice; it’s all part of the overall film-going experience.